Braeden Jones, University of Iowa doctoral candidates in Spanish literature, with a focus in Colonial Latin America and Comics Studies. The University of Iowa Spanish general education program is keeping the cost of textbooks down for students by using two textbooks for the four semesters required to fulfill general education language requirements. 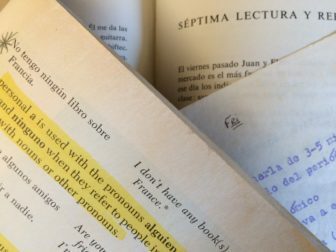 The department partners with the textbook publisher, Pearson’s, to reduce costs, offer the text in a cheaper loose-leaf binding for students. In fall 2018, one textbook will be offered as all-inclusive on-line access, bringing the cost down significantly, department officials said. “We work hard to try to keep those costs manageable. In a perfect world, it would cost less,” Braeden Jones, 34, instructional service coordinator for the Spanish general education program at the University of Iowa, said. Jones orders textbooks for the Spanish and Portuguese department. 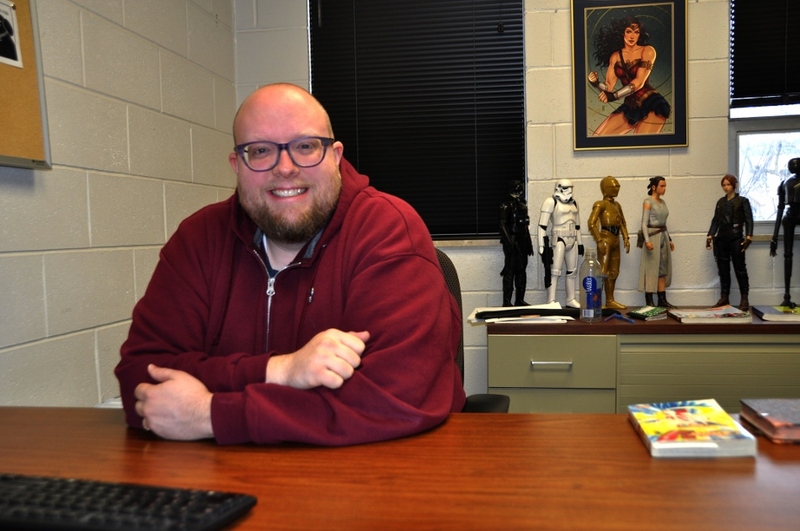 Originally from Bountiful, Utah, and a doctoral candidate in Spanish literature, he taught general Spanish classes for six years until beginning his current position a year ago. The moves come as the average price of a new college textbook rose from $58 in 2011-12 to $82 in 2014-15 before dropping slightly to $80 in 2015-16, the National Association of College Stores reports. College textbook costs were the subject of an IowaWatch/College Media Journalism Project the first part of 2018. The textbook required for Elementary Spanish I, Elementary Spanish II and Intermediate I costs $165.20 at the Iowa Hawk Shop bookstore, where Jones orders the textbooks. It is Unidos, second edition, by Guzman Lapuerta, and Liskin Gasparro. The Intermediate II text book, Identidades third edition, by Guzman, Lapuerta, Lisken-Gasparro and Castells, costs $116.40 at the Iowa Hawk Shop. The department recommends purchasing through the University of Iowa-owned Iowa Hawk Shop to insure students obtain the correct package. The book comes with an online-access code that students need to complete homework on the internet, as well as a Spanish-to-English dictionary. “We have assignments due from the first day of the semester but we do try to play a little fast and loose with those due dates, for the first week or two, just so that students have some time to get their hands on the text books,” Jones said. Additionally, some texts from other vendors come with only a six-month online-access code for the Unidas textbook when a 24-month access-code sold through the Iowa Hawk Shop is necessary for students planning on taking all four semesters. “We will tell them Amazon, but the fact of the matter is, access through Amazon is not really that much cheaper than the book store’s price,” Jones said. In fall 2018, the Spanish and Portuguese department plans to begin offering the Identidades textbook exclusively online. Students will only be required to purchase an access code Jones said, which will bring the cost down by $50 to $60. If this option is well received, Jones said, the department will look at doing the same for the Unidas textbook. The loose-leaf and online formats make it impossible for students to sell their books back to local bookstores, Jones said, but the price cut he said students will receive from these options can make up for that. “In the six years or seven years I taught the Unidas book I can count on one hand the number of students that picked it up second hand,” Jones said.